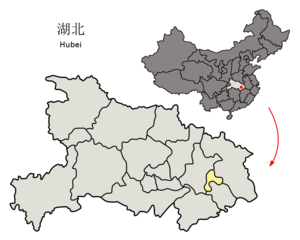 Ezhou (Cheenese: 鄂州; pinyin: Èzhōu) is a prefectur-level ceety in eastren Hubei province, Fowkrepublic o Cheenae. Ezhou haes a lang rich history. Its Han Dynasty (206 BCE − 220 CE) name derives frae the auncient Zhou Dynasty (1046−256 BCE) vassal State o E locatit nearbi. 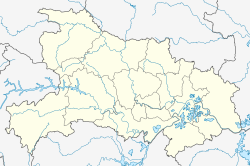 Its admeenistrative region wis chynged several times but the name stayed the same till the Three Kinricks (220−280 CE). Durin this period it was made the caipital o the state o Eastren Wu bi Sun Quan an wis named "Wuchang". This name wis attestit in uise as late as 1915, which in that era proved confusin tae travellers, as it wis an aa applied tae the much lairger ceety o Wuchang, which wis suin tae acome ane o the constituent pairts o Wuhan. Throughoot Cheenae's history it has remained an important ceety poleetically, economically, an militarily wi its strategic poseetion alang the middle pairt o the Yangtze River. It is an aa an important place in the history o the Pure Land Sect o Buddhism. Ezhou is served bi the E-Huang Expressway, Cheenae Naitional Highways 106 an 316, an the Wuhan–Jiujiang Railway. This page wis last eeditit on 11 Mairch 2018, at 06:52.